My time travels are not limited to the city of Pottsville as my old Ford Pinto wagon takes me further back in time to other Schuylkill County communities as well. For instance when driving along East Main Street in Schuylkill Haven, at the intersection with St. John Street, is the Brok-Sel mini-market. It is there if you are in the year 2018. However when driving I often time-trip and go back to the late 19th century. I see the newly constructed grandiose, Victorian three-story building with its impressive tower, the round-windowed turret at the corner, extending to a pointed peak high above all the other buildings except the four story Hotel Grand that was located on the opposite side of St. John Street, which also had Victoria allure. The Hotel Grand was destroyed by a colossal fire in March 1932, leaving the site to be later occupied by the more humble looking brick post office that is still there today. Yes, in my time-traveling Ford Pinto wagon, I pass the business of businessman Pancoast Thomas Hoy. Mr. Hoy opened his first general store business in 1884 west of the railroad tracks on Main Street in Schuylkill Haven. Ten years later he purchased a commercial building at the corner of St. John and Main Streets from the Kline sisters which he tore down to erect a much larger edifice which would contain three floors and a large unfinished attic. A large lodge hall on the third floor was used by the Grand Army of the Republic, an organization consisting of Civil War veterans, as well as by the nativist fraternal Patriotic Order, Sons of America, whose members were clearly identified by their purple uniforms and red Turkish fez hats. Whenever I think of red Turkish fez hats I think of the stout cartoon character, Major Amos B. Hoople, but none of the members I saw leaving the meeting resembled the major at all. In 1910 Mr. Hoy incorporated his business and it became known as P.T. Hoy & Sons Company. The store had seven full-time clerks and during the spring five or six girls worked part time in the flower and plant division. P.T. ( the name he preferred to be known as), was its president with son Lewis as manager and son Rudy as secretary. In the beginning the store was primarily a dry goods store. The only canned goods according to son Rudy Hoy were the sardines and salmon. As time went on Hoy’s became well known for its dry goods, groceries, crockery and chinaware. Quite the entrepreneur, Mr. Hoy also engaged in the selling of Brockway trucks and automobiles under the name of P.T. Hoy Motor Sales Company. P.T. Hoy died at age 83 in March 1939, after a lengthy illness. 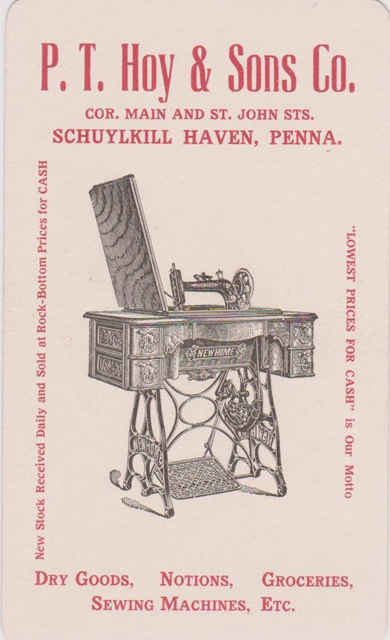 He had been in business for 63 years and had been one of Schuylkill Haven’s oldest residents. Sometimes while driving in the station wagon I would end up in the early 1960s, during the final days of the store after it had lost its Victorian charm, transformed into an eerie decaying gothic structure on the verge of collapse; at night bats could be seen flying about the tower in the moonlight…the house of usher… I watched a young boy leaving the store with a paper bag of rabbit pellets that were sold for a quarter by Rudy Hoy who scooped them out of a barrel and weighed them. I watched the boy buy a Green Spot soda from the machine on the store’s side porch before he continued on St. John Street past the dilapidated wooden garage at the corner of Wilson Street that was part of the Hoy property; the garage was still adorned with a tattered and fading years old “Vote Nixon-Lodge” poster. Of course the boy looked familiar; the boy was me. I kept my hands on the Pinto’s steering wheel and continued. Soon that timeworn garage would be demolished for the erection of a charmless, box-shaped brick State Store. 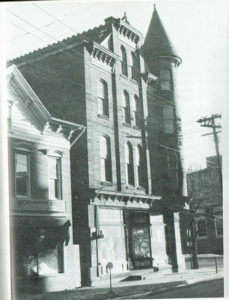 Next to be dismantled was the portion of Hoy property that was home of “Abe’s Workingmen’s Store,” a local business operated by Harry Gabralovich, a fixture on Main Street since 1934. 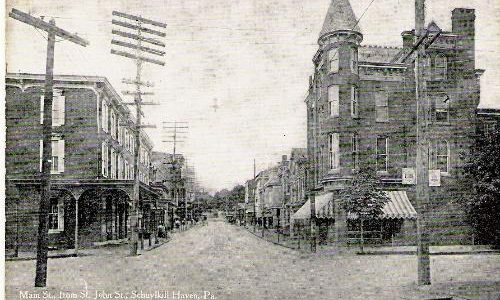 Finally in 1964 the rest of the once magnificent Hoy building was razed and Schuylkill Haven’s Main Street lost forever its Victorian past.